Be measured heat sealing temperature range of sealing compound, heat sealing strength, hot package of speed, heat sealing pressure, used for plastic, flexible packaging composite membrane, coated paper, foil. 2. Air-driven system: Including pressure gauges, guide rods, cylinder, pneumatic valve, pressure regulator handles, so on. pull out the pressure regulator handle, turn right to increase the sealing pressure, a left turn can reduce the sealing pressure, after finishing the pressure setting and turn the handle to the host side to lockup the air pressure. 3. Sealing device Composed by the upper and lower sealing bars, upper rods connect with cylinder, and on the upper sealing bar has insulation panels, to prevent transmission of heat to the cylinder. 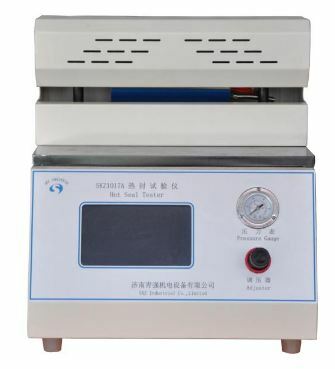 Aluminum rod for sealing, heat sealing the central rod for the heater, above the heat sealing of the lower rod has silica gel plate, can ease the pressure at the time of the impact of heat sealing, back of heat sealing rods are equipped with body temperature. 4. Temperature Control System upper temperature controller control the upper sealing bars, lower control the lower sealing bar, by adjusting the dial on the button, can set temperature easily. 5. Time-conditioning systems Sealing time can be set up by adjusting the dial button with range 0.01s ~ 999.9h, in manual mode, press the foot pedal, sealing rods were pressed down; in automatic mode, the upper and lower sealing rods press time from the calculagraph control automatically, once automatic reset. Timer units typically 0.1 seconds, on the panel of the timer have the time adjustment button, sealing time adjustment can be done. 7. heat sealing pressure: 0 ~ 0.8Mpa.